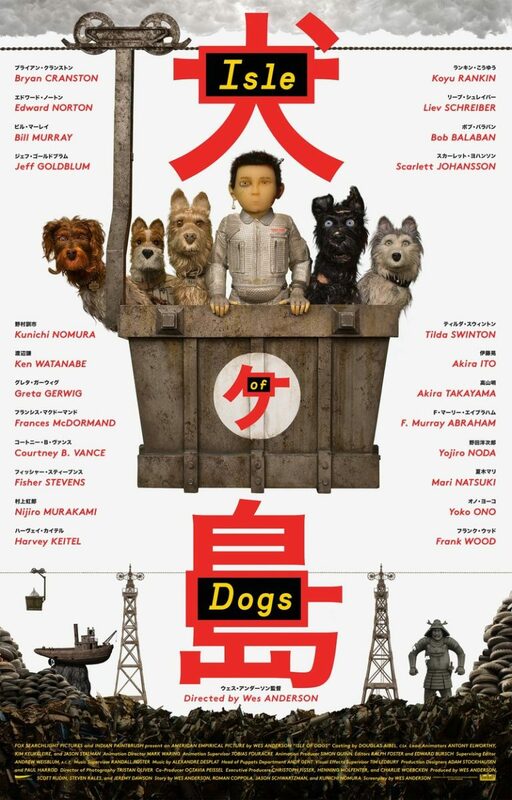 "Often Adorable but Quirky Tale About a Boy and His Dog"
ISLE OF DOGS is a quirky but often adorable animated comedy set in the future about a boy and some dogs in Japan trying to stop a diabolical plot by a cat-loving mayor and his cat-loving clan to wipe out all the dogs on the Japanese archipelago. ISLE OF DOGS is a funny comical adventure extolling God, prayer, kindness, and sticking up for “man’s best friend,” but it’s a bit quirky and contains three misplaced obscenities, light discussion about dogs mating, some violence, and lots of jeopardy. ISLE OF DOGS is a quirky but often adorable animated comedy set in the future about a boy and some dogs in Japan trying to stop a diabolical plot by a cat-loving mayor and his cat-loving clan to wipe out all the dogs on the Japanese archipelago. ISLE OF DOGS is a funny comical adventure extolling God, prayer, kindness, and sticking up for “man’s best friend,” but it’s a bit quirky and contains three obscenities, some violence and lots of jeopardy. The movie opens with a brief prologue about a boy samurai who stops the founder of the Kobayashi clan, a cat-loving family that hates dogs. Cut to 20 years from the present. Most of the dogs in Japan have come down with a disease called snout fever and developed a dog flu. To protect the human population, cat-loving Mayor Kobayashi of Megasaki has ordered all dogs exiled to Trash Island, a huge landfill. The first dog to be exiled is orphan Atari’s guard dog, Spots. However, 12-year-old Atari takes a small plane to the island to find and rescue Spots. A group of mostly friendly dogs on the island helps Atari look for Spots. While doing so, they uncover a secret plot by the cat-loving mayor to wipe out all dogs once and for all. They also discover Mayor Kobayashi and his minions created the dog flu to begin with and are suppressing the news of an antidote. Can Atari and his friends stop the mayor’s evil plot and cure the sick dogs? Will Atari find his missing dog? Written and directed by the imaginative Wes Anderson, ISLE OF DOGS has many funny, adorable and exciting moments. Its stop-motion animation, settings and art direction are visually rich. However, the movie is also a bit quirky. For example, one of the dogs Atari meets says he has a biting problem, and jokes are made about the dog going crazy once in a while and biting people’s hands. He just can’t help himself. Another one of the dogs (voiced by Jeff Goldblum) is also very gossipy, a character flaw which he himself admits in one funny scene. Another quirky thing about the movie is it divides the story into four chapters and a prologue, which is usually not a good idea. There are also a couple brief flashbacks that slow down the plot. Much of the dialogue is also quirky, but quirky in a funny way that’s often clever and interesting, though a bit dry. Overall, ISLE OF DOGS has a strong moral worldview with redemptive elements. It extols kindness and rebukes tyranny and evil. Also, God is acknowledged in one piece of dialogue, and toward the end people are asked to pray for two characters on the verge of death. It’s a general request for prayer, however, so the movie makes no overt reference to any particular religion. In addition to these things, one of the villains finally realizes the wrong he’s done. He repents and reconciles with a family member whom he wronged. Also, he even tries to make up for what he did. That said, ISLE OF DOGS contains lots of jeopardy and some strong violence. One scene involves a kidney transplant operation. Other scenes show characters fighting but the fighting always is portrayed in a cloud of dust, like an old cartoon. Also, there’s some dialogue about dogs mating with other dogs. One female dog denies she’s mated with any other dog. Another female dog has a litter of puppies, but the father of the puppies is committed to their new family, so the movie has an implied biblical view of such matters. Finally, ISLE OF DOGS has three misplaced obscenities. All in all, therefore, MOVIEGUIDE® advises caution for older children for the PG-13 rated ISLE OF DOGS. Some of the comedy in ISLE OF DOGS might be a little too dry for many children anyway. Otherwise, however, the movie is a joy to watch. Light miscellaneous immorality includes evil mayor and his minions hatch an evil secret plot against pet dogs, but they are opposed by the good guys, girl trying to expose the conspiracy says she hates the evil mayor, one dog admits he likes to gossip, and villains lie, but the good guys successfully expose their lies eventually. ISLE OF DOGS is a quirky but often adorable animated comedy. Twenty years in the future, most dogs in Japan have come down with dog flu. To protect the human population, cat-loving Mayor Kobayashi of Megasaki orders all dogs exiled to Trash Island, a huge landfill. The first dog exiled is his orphaned 12-year-old nephew Atari’s guard dog, Spots. Atari travels to the island to rescue Spots. A group of mostly friendly dogs helps Atari look for Spots. They uncover a secret plot by the cat-loving mayor to wipe out all dogs. Can Atari and his friends stop the mayor’s evil plot? Will Atari find Spots? ISLE OF DOGS has many funny, adorable, exciting moments. It’s also visually rich. Though it’s sometimes too quirky, ISLE OF DOGS has a strong moral worldview that extols kindness and rebukes tyranny and evil. Also, God is acknowledged in one line, and people are asked to pray for two endangered characters. ISLE OF DOGS contains three misplaced obscenities, light discussion about dogs mating, some violence, and lots of jeopardy. So, MOVIEGUIDE® advises caution for older children.